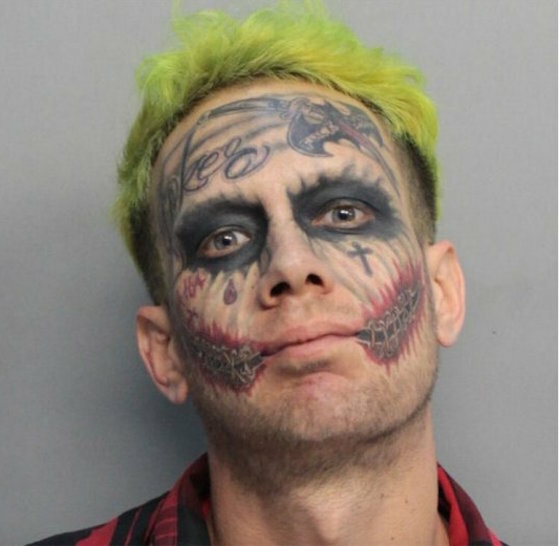 Lawrence Patrick Sullivan, a Florida man whose tattoos and dyed hair make him look an awful lot like Batman's nemesis the Joker, was arrested for waving a loaded gun at traffic in Miami last night (May 23). According to NBC6 Miami [via The Hollywood Reporter], the 29-year-old was arrested after multiple people reported a man with green hair pointing a loaded gun at cars. When police located him, he allegedly had a Smith & Wesson handgun with six rounds loaded in its magazine. Sullivan is being held on a $5,000 bond. When he appeared in his bail hearing, he waved the right to a public defender, explaining that he didn't want to fill out the paperwork. A judge advised him to change his mind and accept help. Watch the man's bail hearing below.